"For this hearty stew, beef, carrots, and potatoes simmer all day with a flavorful beef broth mixed with tomato paste and coffee." Season the beef with black pepper and coat with flour. Heat the oil in a skillet. Add the beef and cook until browned. Place the onions, potatoes, carrots, garlic and thyme in a 3 1/2-quart slow cooker. Top with the beef. Mix the tomato paste, coffee and 1 cup broth. Pour the coffee mixture and the remaining broth into the slow cooker. Cover and cook on LOW 8 to 10 hours. * or until done. Serve with the sour cream and chopped green onions, if desired. 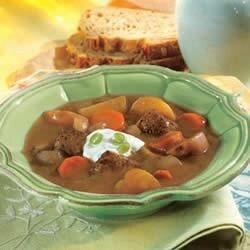 Swanson Kitchen Tip: This recipe is also great using Swanson® Lower Sodium or Certified Organic Beef Broth in place of the regular beef broth. Great recipie, didnt need to cook for 8 hrs though.. 3hrs was enough, added more veggies and didnt need that much Black Pepper.. Apart from that, fantastic.